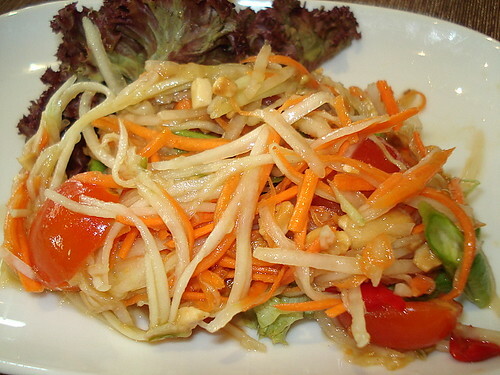 Green papaya and carrot salad, originally uploaded by Camemberu. 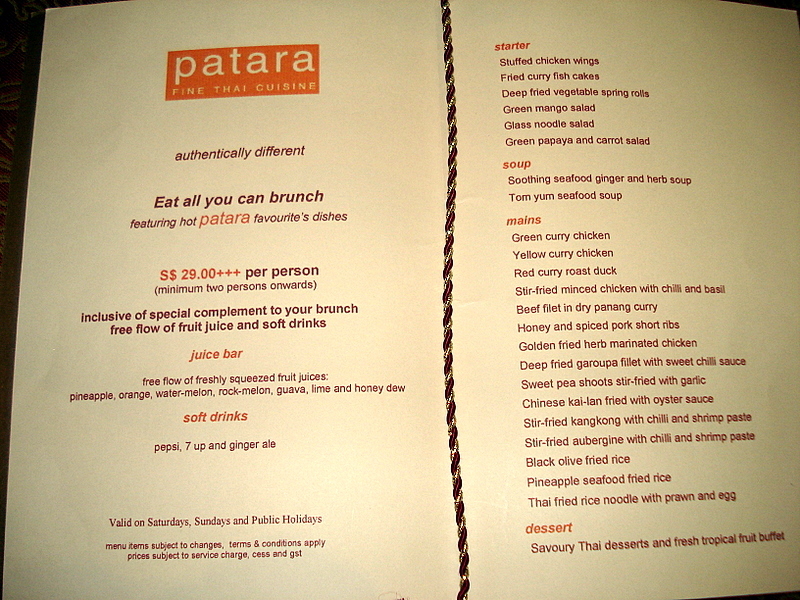 Checked out the weekend brunch (S$29+++ per person; minimum two diners) at Patara Fine Thai Cuisine at Tanglin Mall. Dining here can get expensive, so this can be fairly good value if you want to sample some of their favourite menu items. See the full menu of items (starters, soups, mains) here - the buffet even includes free-flow fruit juices and soft drinks. We began with some starters. The green papaya and carrot salad was unanimously our favourite dish (almost wanted a second helping). It was bitingly spicy, tart, savoury and intense. A jolt for the tastebuds! 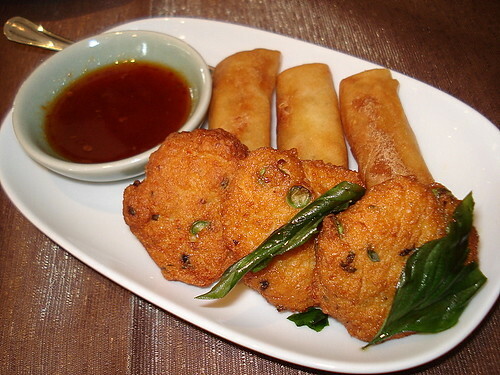 Fried curry fish cakes and vegetable spring rolls, originally uploaded by Camemberu. We also had fish cakes and spring rolls. Decently done, although the spring rolls were a little plain if taken without the sauce. 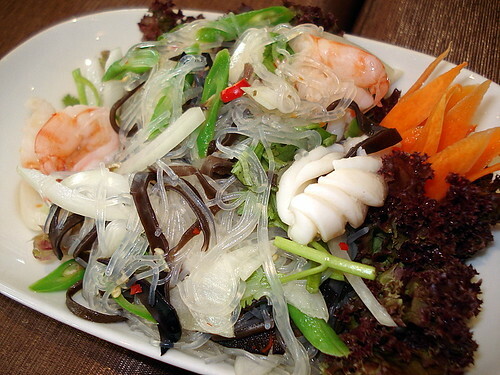 Glass noodle salad, originally uploaded by Camemberu. Yum woon sen is one of my favourite. Glass noodle salad - good, fresh ingredients but a little bland. 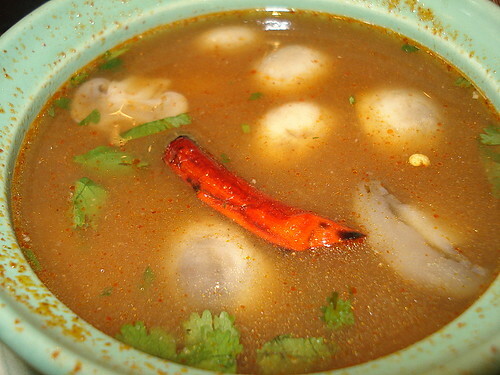 Tom yum seafood soup, originally uploaded by Camemberu. The tom yum soup was too sweet and not tangy or spicy enough for our liking. I think they toned down the fieryness to suit non-Thai palates. 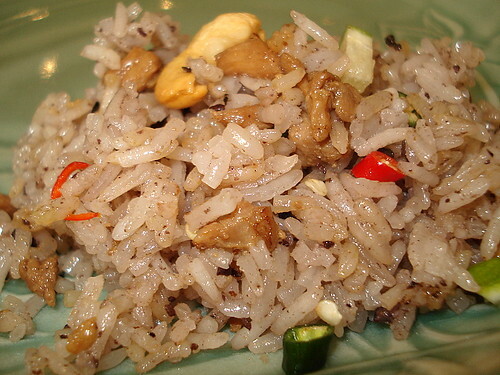 Black olive fried rice, originally uploaded by Camemberu. I liked the black olive fried rice. Each grain coated with just enough savoury goodness to be eaten on its own. Lots of little chunks of meat, chili padi, cashew nuts and even cubed lime with rind still intact (gives a tangy bitter kick)! 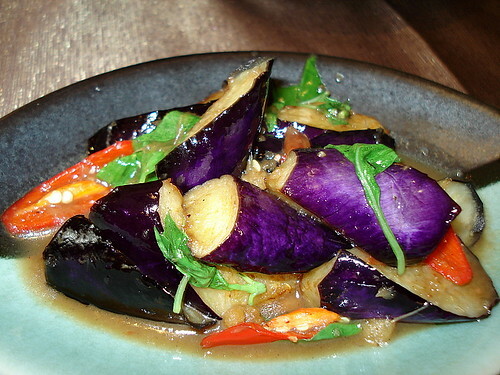 Stir-fried aubergine with chili and shrimp paste, originally uploaded by Camemberu. This dish tasted strongly of basil but deliciously so. Gravy a little salty. Aubergines fried just right. Tender to the bite but still held their shape well. 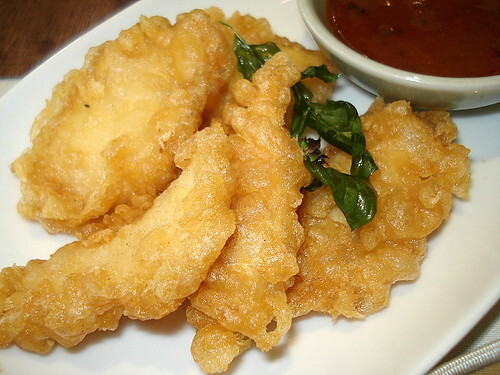 Golden fried herb marinated chicken, originally uploaded by Camemberu. I wasn't expecting scrawny chicken wings for the fried chicken but I guess they were extra crispy that way. The "herb marinade" was potentially interesting but I think the oil they fried the chicken in was a bit too...heavy - I don't know, it's like that 'pungent' oil the Thai street hawkers use. 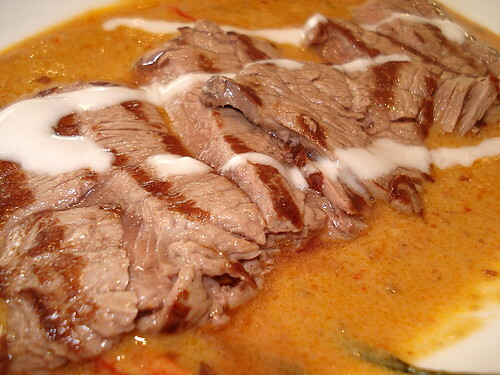 Beef filet in dry panang curry, originally uploaded by Camemberu. Beef seared on a grill, sliced and placed on panang curry. Hubby liked this. I thought the beef and curry were too...separate. The tastes did not integrate. 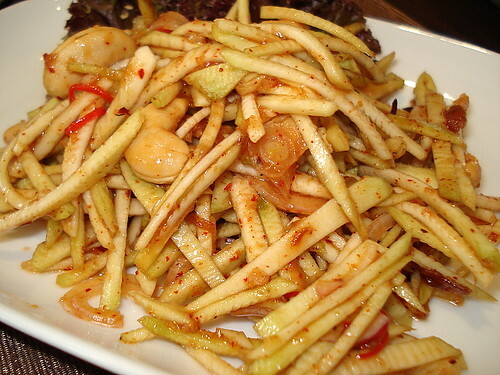 Green mango salad, originally uploaded by Camemberu. We hankered for more spicy salads to refresh the palate, so we tried the green mango version. Not as nice as the papaya one, although just as spicy and intense. 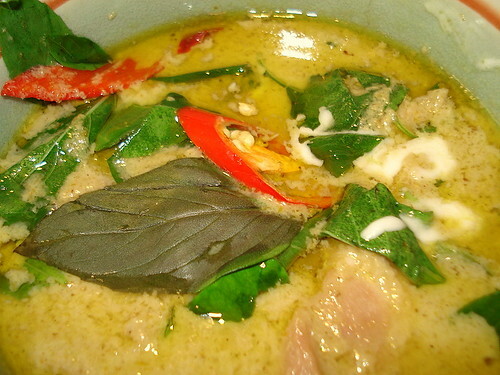 Green curry chicken, originally uploaded by Camemberu. This was way too salty. Otherwise, would have been delicious. Maybe it would have been better paired with lots of white steamed rice instead of olive rice. 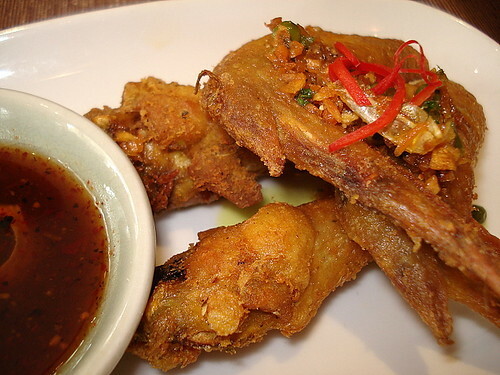 Deep-fried garoupa fillet with sweet chili sauce, originally uploaded by Camemberu. Overly greasy. Somehow the fried stuff here has that really heavy oily taste. The sauce also was very strong (not the usual Thai sweet chili - tasted like it was made from dried chili), so we went very light on it. Desserts and fruits, originally uploaded by Camemberu. 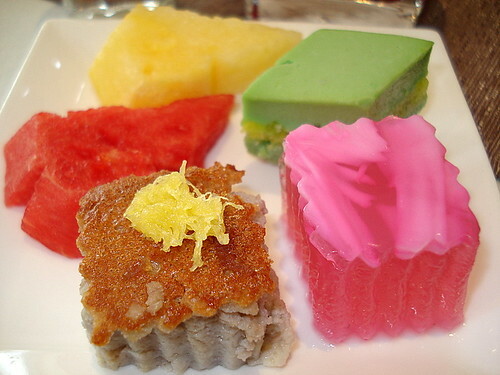 Thai desserts always look so lovely. Some of the desserts here were nice - the stuff in shot glasses (not pictured here) like red rubies with cubed jackfruit and the sticky mango rice. I love the firm jellies with coconut shreds (see pink cube). The free-flow juice bar was also well-stocked - you can do your own mixes, watermelon and lime go well together! Nice brunch although not the best Thai food I've had. Portions here are deliberately small, so you can taste more dishes. i tried the food on last friday. not nice! Wanted to try the buffet, but ended up with the ala-carte. Maybe the next time, I shall try the buffet and see.